Irving Berlin was the most popular songwriter in history. 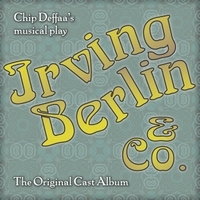 ASCAP award-winner Chip Deffaa's musical comedy, "Irving Berlin & Co" (published by Eldridge Plays), uses two dozen irresistible Berlin songs to tell his story. This is the premiere recording. ASCAP award-winner Chip Deffaa's high-spirited musical comedy “IRVING BERLIN & CO.” tells the story of the most successful songwriter in history. Created by one of the world’s foremost experts on Berlin – award-winning writer/director Chip Deffaa – “IRVING BERLIN & CO.” uses two dozen spirited Berlin songs to help tell his life story. The score includes some famed Berlin numbers that most everyone knows. There are also some wondrous rarities and rediscoveries--including some numbers that have not been heard or recorded in a hundred years. And some numbers that--to the best of our knowledge--have never before been recorded! This cast album--featuring a company of 24 artists--is being released now, exclusively in the U.S., through CDBaby. This album is one of seven albums celebrating Irving Berlin that are being produced, over a period of several years, by Chip Deffaa. You might also enjoy such recently released cast albums, also produced by Deffaa, as "Irving Berlin's America" and "The Irving Berlin Ragtime Revue." I’ve spent eight years researching/writing about Berlin. This is one of five different shows about Berlin that I’ve created, each featuring a different point of view, with some different stories and songs. I’m very proud of–and grateful to–our carefully hand-picked company. I’ve worked before with most of these artists; several of them (including Emily Bordonaro and Michael Kasper, for whom I wrote the roles that they originated) have been part of this project from the very first reading at Ripley-Grier Studios in NYC. I’d gladly work again with any of them. We have a company of 24 recording artists on this album. (The play can be performed, with some “doubling,” by as few as 12 actors.) I’d like to briefly introduce you to our cast, which includes some of my favorite performers in New York City. Peter Charney has been an invaluable asset on productions of mine–as a singer, actor, assistant director, and/or video producer–for eight years; he originated the role of Eddie Foy Jr. In my musical “The Seven Little Foys,” and is featured on the cast album. He recently made his New York playwriting debut with “The Puppet Show Man” at Dixon Place. I’m delighted that Jeffrey Sewell (whose talent first impressed me via videos on YouTube nearly five years ago) made the trip down to New York from Massachusetts for this project.... And I’m grateful that, to participate in this project, David Cook flew in all the way from Texas (where he starred, several years ago, in my musical “Yankee Doodle Dandy,” with the Crystal Sea Drama Company).... I’m glad that such impressive up-and-coming performers as Will Conard, Jenn Spotz, and Brian Vincent Grimaldi – whom I’ve enjoyed in various productions they’ve starred in– are on this recording: I hope we’ll get to do more work in the future. I first fell in love with the singing voice of our special guest artist, acclaimed vocalist Elena Bennett, when I first heard her at the late Erv Raible’s great Greenwich Village nightspot, Eight-Eights, about a quarter-century ago. And I loved the album she made with Fred Barton’s 28-piece orchestra, “A Wrinkle in Swingtime.” It means a lot to me that she’s one this album now. Irving Berlin is–along with George M. Cohan, Cole Porter, Jerome Kern, and the Gershwins–one of my all-time favorite songwriters. I’m happy that this album includes such celebrated numbers of Berlin’s as “I Love a Piano,” “Alexander’s Ragtime Band,” “Mandy,” and “The International Rag.” I’m also glad the album includes some rarities you will find nowhere else, such as “In My Cozy Kitchenette Apartment,” “They Call it Dancing,” and “There’s Something Nice About the South.” To the best of my knowledge, Missy Dreier and Michael Townsend Wright have made the first-ever recording of “In My Cozy Kitchenette Apartment,” and Jonah Barricklo has made the first-ever recording of “There’s Something Nice About the South.” And although there were a couple instrumental recordings of Berlin’s “They Call it Dancing” back in the 1920s, Brian Grimaldi appears to be the first person ever to record the lyrics to that song (which were considered awfully daring when the song was new). Playwright/director Chip Deffaa is represented by the Fifi Oscard Agency (attention: Peter Sawyer, President), 1440 Broadway, 23rd Floor, New York, NY 10018, Email: psawyer@fifioscard.com, tel. (212) 764-1100. This album is dedicated by the producer--with appreciation and fond remembrance--to the good people of School Nine.